Remember in the GAPS chocolate vanilla cookies there were those yummy chocolate drops..and the were GAPS friendly? Well, hopefully I didn’t keep you waiting too long….but it was totally worth it! Honestly I usually just make recipes up and a lot of times I forget to write them down, so I have to remake them and write down the measurements. I am getting better at this, but I had to recreate this recipe for you. Don’t worry it turned out the same. Actually my sister says they are better than before! Is your chocolate craving really magnesium? This chocolate can also be used as a spread for whatever you want: banana’s, crepes, pancakes, or even stir a little in some coconut milk! When I made these GAPS chocolate drops I wanted to give the body what it is really asking for when you want chocolate. Your body is really craving magnesium! So why don’t you satisfy your chocolate cravings and your body cravings at the same time? I don’t like the name magnesium chocolate, but you can sure call it that if you want to. I don’t have cocoa butter , but I always have coconut oil around, and I am sure many of you are also that way. I have to warn you these do melt fast, so when you put these in recipes stir them in at the last-minute or place directly on top of pancakes/cookies so they don’t melt and turn he batter brown! I will give you step by step interactions to make it an easy little task! 6. 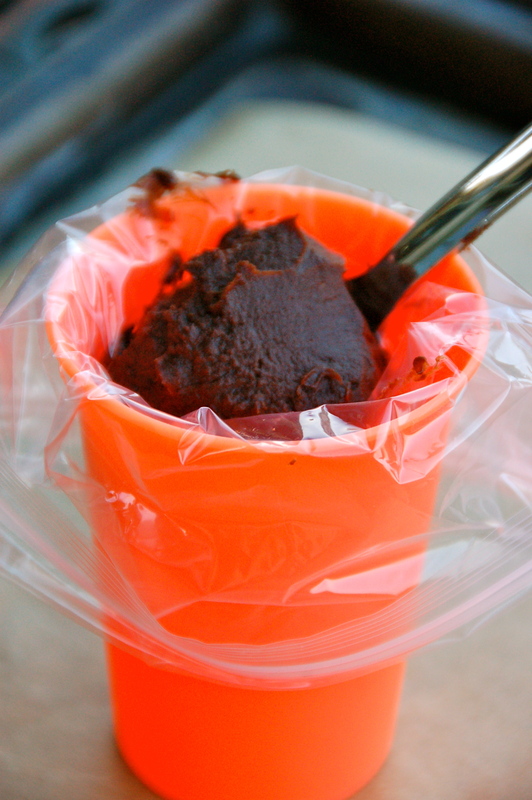 Once your chocolate mix resembles Nutella/peanut butter constancy, spoon it into a plastic bag ( I roll my plastic bag over a cup to make it easier to spoon into). See how the chocolate consistent changed from step 4 to step 6? 7. Cut off a very little corner off the tip of the plastic bag and pipe little chocolate chips. Since the consistency is stable you will be able to create the little point at the top! If it is too liquidy then they will end up like flat drops (The picture below was my first batch–I was a little impatient and did not let it set enough so they are flat–woops!) You have to work quickly or pipe small batches at once so they don’t melt on the tray too! 9. Scrape off the chocolate chips into a container and put directly in the freezer. 10. Repeat until chocolate mix is gone! 12. 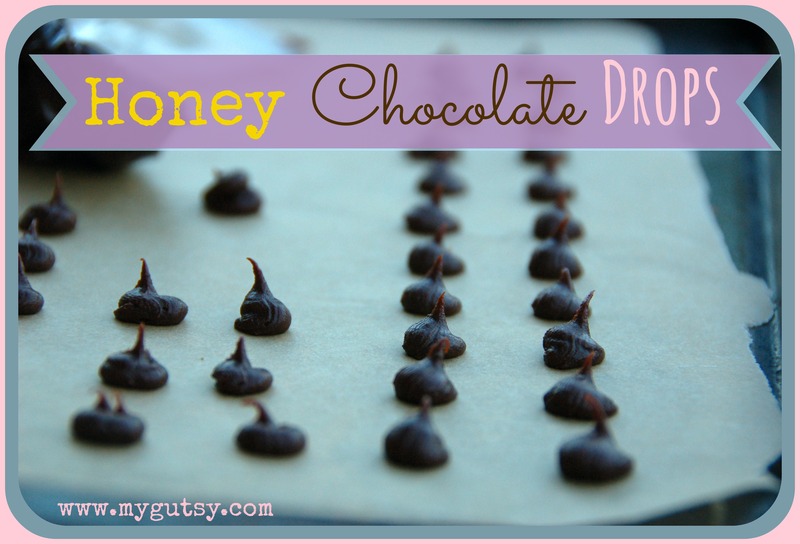 Store the GAPS chocolate drops in the freezer until you use them. Hi Caroline. I like your blog. 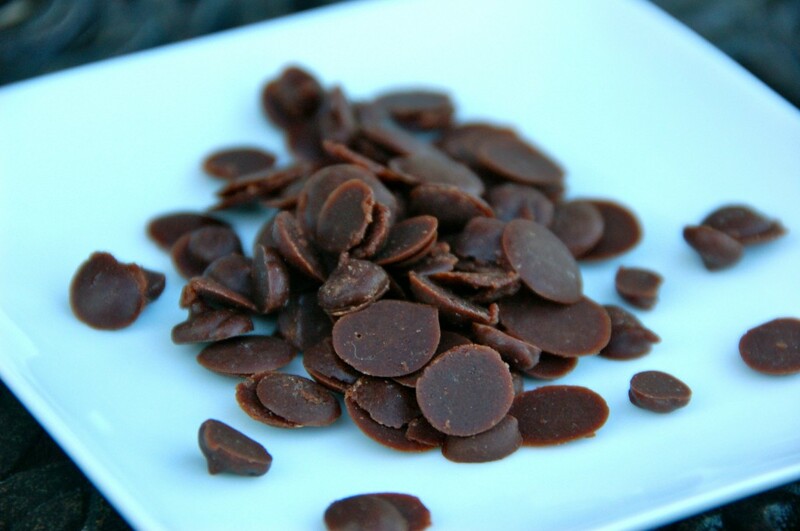 I discovered this post about chocolate drops on The Healthy Home Economist’s Monday Mania. I am very interested in making this. Thanks for posting. I have a question about the ingredients. You mentioned that a chocolate craving might be a signal that your body needs magnesium (I have heard this recently a few times). Your ingredient list says to use sea salt OR the mega mag liquid. I am assuming you can use one or the other? And if you don’t use the mega mag liquid, does the sea salt provide any magnesium? Thanks! Fantastic! Thanks for this further explanation. 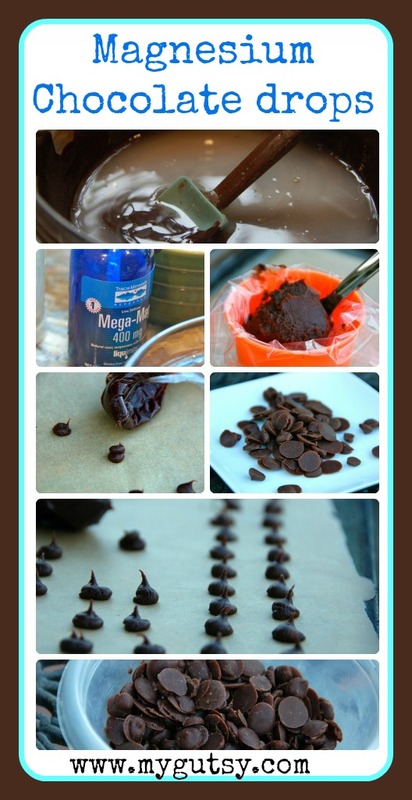 Love that magnesium oil … Love chocolate too 🙂 Thanks for sharing this with us at Scratch Cookin’ Tuesday! Thanks! you could always just use carob powder and coconut oil! They are good for you too! I’m pretty lazy so I think I’ll just pour the liquid chocolate out onto parchment in a baking sheet, freeze and then chop to make chocolate chunks! I think they will be great in homemade ice cream too! Anyone try this yet? Hi Thanks for the recipe. Do they stay together when baked in cookies or melt allover and drop off the cookie onto the sheet? I tried cutting cocoa butter into chunks and putting it in cookies and it didn;t stay together like chocolate chips do so made a big mess. Isabelle, Yes the ones I make with coconut oil do get melty but like you saw in the picture, they turn more like a “chocolate vanilla cookie” because they melt. I am sorry to hear your didn’t work out with the cocoa butter,I was going to try that too but now i will be prepared! I think I’m going to use your recipe here like your berry delights, a way to pop some coconut nutrition down the ole pie hole. 😉 Thanks!! How do u know when you are ready for chocolate?? I think you might be a genius, thanks for this post. Did you contact them to see what is in Bakers Unsweetened Chocolate? Often these have soy lecithin and sometimes are contaminated with wheat. The Bakers one doesn’t appear to have wheat but it does have soy lecithin according to this. http://www.labelwatch.com/prod_results.php?pid=122505 Why not add raw cocoa powder and juggle the other ingredients a bit to compensate. I make chocolate with pure cocoa butter and add other things to it. These all seem to need to be kept frozen though because they don’t have the binders to keep them from melting and going to mush but they taste awesome! INGREDIENTS: Chocolate. I will change it to have cocoa powder as an option, I tried it today and it worked! Googled it and same brand, same kind lists soy lecithin. really? The one with soy has sugar in it. The one I am using has NO sugar, just the ingredients above. where did you find that info? I made these the other day. Ok, I didn’t make them into drops, but I did break it up into pieces. My kids LOVE it (I’m with them). My husband is more picky, he was surprised by the coconut flavor of the chocolate. 🙂 I told him I’d try again with some flavorless coconut oil. Don’t know if he’ll like it, he is a little more picky when it comes to some things. hi! I am so glad you like them. Yes breaking it up like that is easier and just as yummy! I have tried with expeller and it is still great! My dad and brother are coconut detectives too! I made these using organic cocoa powder and they turned out great! The drops weren’t as pretty as yours and were a little “gooey”, but they taste yummy! Thank you for the recipe! I tried this before, but the honey all fell to the bottom. I didn’t let it cool, maybe that’s the key. Thanks! Can you bake with them? I love your recipes!. can you make a natural sugar free version of butterscotch chips for cookies/bake goods?. Thank you for your story! This is amazing. WE are trying to heal my daughter and son through GAPS right now. God has blessed you and you are truly an amazing person. A lot more energy than me and I LOVE your recipes. Thank you for your hard work and story.